All-wheel drive is perfect for when the road gets slippery, and drivers can open the roof when the weather is nice enough. The weather outside Detroit’s Cobo Hall is quite chilly, but the bright red Audi S5 Cabriolet on display on the convention floor at the North American International Auto Show makes us look forward to enjoying the performance model in warmer seasons. The quilted, cream leather seems like the perfect place to soak up some of the sun's rays. The S5 Cabriolet looks largely identical to the rest of the model variations, except for the opening roof. While we can’t see it in action on the show floor, the fabric top needs 15 seconds to open or 18 seconds to close. Once inside, supportive seats hold the occupants tight and carbon fiber dashboard trim communicates that this is a performance-focused vehicle. 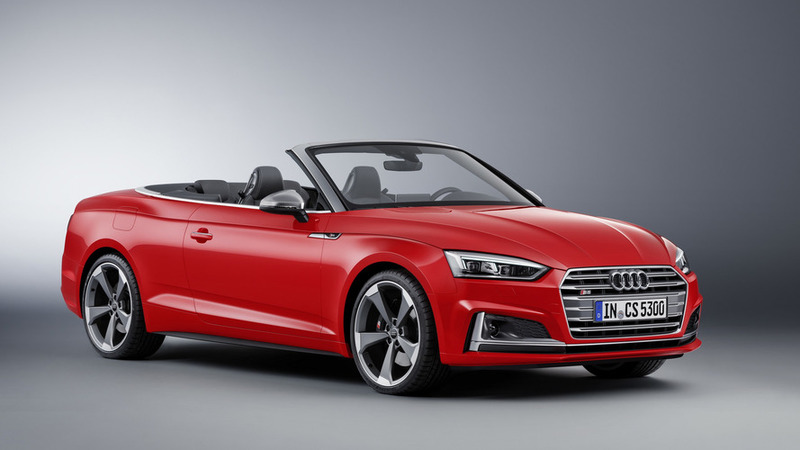 It's not evident just by looking at the new S5 Cabriolet, but the droptop has a 40-percent improvement in torsional stiffness and is up to 99-pounds (45-kilograms) lighter than its predecessor. The improvements come in addition to the convertible riding on a 0.6-inch (14-mm) longer wheelbase, which rear passengers should notice thanks to the increased legroom. 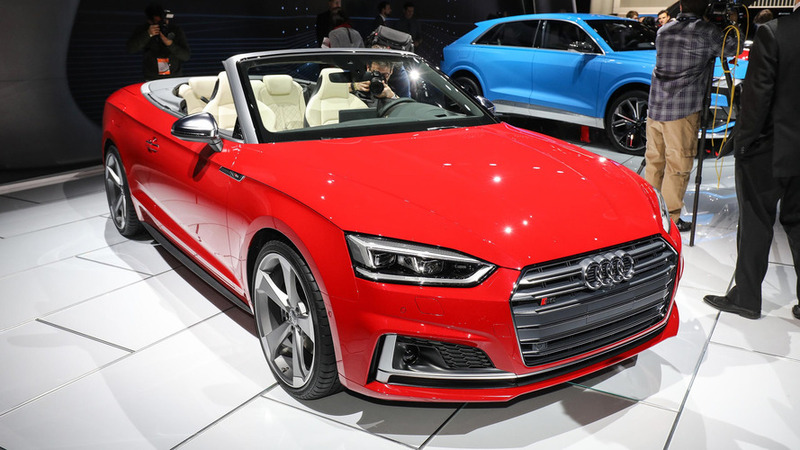 Like the rest of the S5 range, the cabriolet uses the brand’s 3.0-liter turbocharged V6 with 354 horsepower (260 kilowatts) and 369 pound-feet (500 Newton-meters) and comes with an eight-speed automatic transmission. It needs 4.8 seconds to reach 60 miles per hour (97 kilometers per hour). 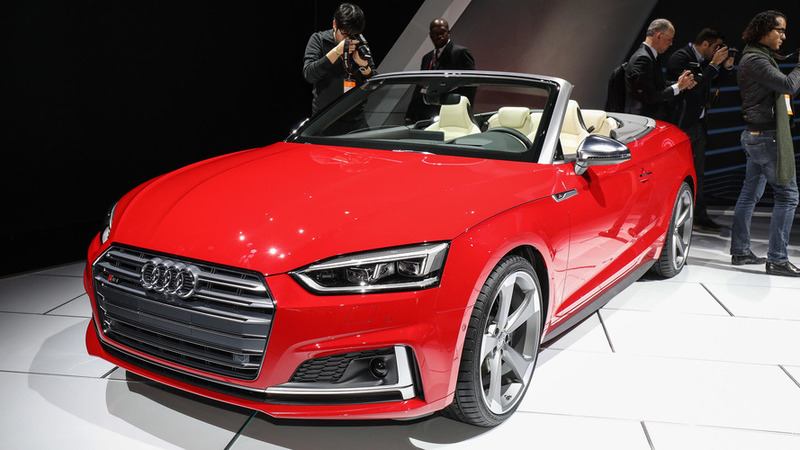 While not on display in Detroit, Audi is also introducing the A5 Cabriolet with a 2.0-liter turbocharged four-cylinder producing 252 hp (185 kW) and 273 lb-ft (370 Nm) and seven-speed dual-clutch gearbox. It needs six seconds to reach 60 mph (97 kph). Regardless of which model buyer’s choose, they get an all-wheel drive system with a 40:60 front-rear power split. S5 customers can also get an optional dynamic steering system with a speed-dependent variable ratio. HERNDON, Virginia, January 5, 2017 – Completing the new generation of the A5 family, the all-new 2018 Audi A5 and S5 Cabriolet will make their US debut at the 2017 North American International Auto Show. With a fully automatic soft top that opens in 15 seconds and closes in 18 seconds at speeds of up to 31 mph and seating for up to four, the A5 and S5 Cabriolet are the perfect combination of design, top-down driving and dynamic performance. The A5 and S5 Cabriolet feature a fully electronic top that can be lowered using the new one-touch opening function, in just 15 seconds, at speeds of up to 31 mph. With the top up, the Cabriolet is designed for a refined driving experience. The soft cloth top complements the car’s design and delivers outstanding acoustics thanks to effective insulation. When opened, the top folds into three layers and rests in a tray underneath the luggage compartment thereby offering the largest possible luggage space at all times. Thanks to a smart mix of materials and lightweight design, the A5 and S5 Cabriolet models are 40 percent more rigid but lighter than their predecessors (55 pounds for the A5 and 99 pounds for the S5) and have increased in length and width. That increase in size translates into over an inch more front passenger shoulder room (26mm) and rear legroom (30mm). Similar to the Coupe and Sportback models, the A5 Cabriolet comes equipped with a 2.0-liter four-cylinder engine mated to a seven-speed S tronic® dual-clutch automatic transmission that produces 252 hp and 273 lb-ft of torque and sprints from 0-60 mph in 6.0 seconds, an improvement of 0.6 seconds compared to the previous generation. 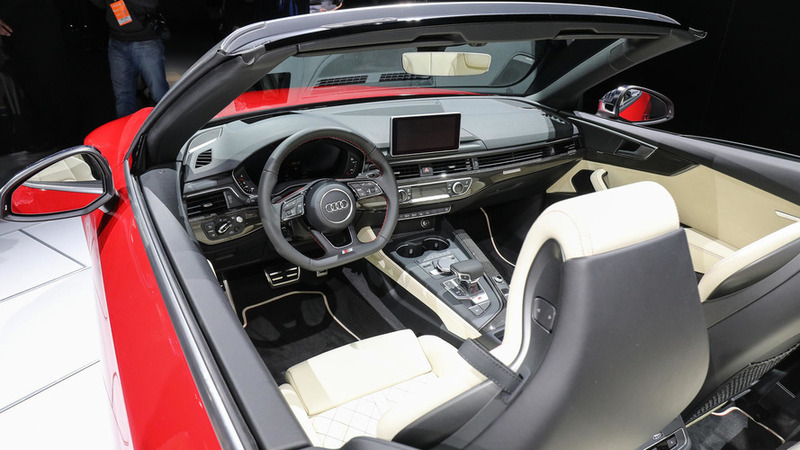 The S5 Cabriolet is equipped with a re-engineered 3.0-liter TFSI® V6 engine to produce an impressive 354 hp and 369 lb-ft of torque between 1370 – 4500 rpm, and sprints from 0-60 mph in 4.8 seconds, half a second faster than its predecessor. The S5 is also newly equipped with an eight-speed Tiptronic® automatic transmission that is well suited for the low-end torque of the new 3.0-liter turbocharged engine. Both variants of the Cabriolet come standard-equipped with quattro® all-wheel drive, offering enhanced agility through a self-locking center differential, with a basic ratio of 40:60 front to rear, and wheel-selective torque control. A redesigned front five-link suspension with lightweight construction offers greater steering precision and excellent handling through optimized steering-rack placement direct at wheel centers. Suspension tuning enhancements have also improved through the wider track and longer wheelbase. Available dynamic steering (S5 models only) offers a variable steering ratio that adjusts based on vehicle speed and the Audi drive select setting. 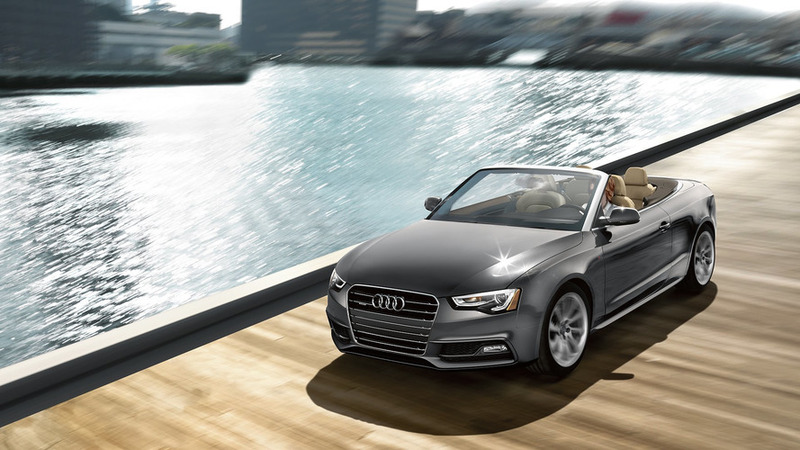 The 2018 A5 and S5 Cabriolet models mirror the coupe’s breakthrough design language, featuring a wider, flatter Singleframe® grille and longer, lower hood lines that highlight the powerful engines of the new A5 family vehicles. The precise wave-design shoulder line is more pronounced than previous generations and wider wheel arches provide design cues to the vehicle’s quattro® DNA. Three-dimensional LED taillights with dynamic turn signals offer a distinctly powerful look and emphasize vehicle width. The refined interior of the A5 and S5 Cabriolet, with seating for up to four standard, includes greater attention to detail through functional refinements and additional driver-focused technologies. A three-dimensional decorative inlay trim with climate control integration spans from the door panels across the dashboard and adds breadth and lightness. The available 20-speaker Bang & Olufsen® sound system with 3D sound and two subwoofers offers both an acoustic and visual highlight in the interior. The A5 and S5 Cabriolet offer the same advanced infotainment systems as the A5 Coupe and Sportback models including the available Audi virtual cockpit, MMI® navigation plus, standard Audi smartphone interface and newly available in-car Audi connect® infotainment and security features, supported by 4G LTE connectivity (where available). With natural language voice control and free-text search, A5 and S5 Cabriolet drivers can now control infotainment functions more effortlessly and intuitively. Standard safety belt microphones for the driver and front passenger help improve voice quality commands even with the top down. A full suite of advanced driver assistance systems, including standard Audi pre sense® basic and city and available Audi adaptive cruise control with stop & go and traffic jam assist, help drivers navigate the road and traffic with increased confidence. Google Earth™ and “street view” services may not be available after December 2017.